They look like long beans from here. It's possible. They seemed a bit different in shape and stiffer than long beans. Maybe they are just older long beans? Though, there was a group of shoppers who were quite fascinated and interested in them. If they were just long beans, unless they were particularly cheap, I don't think they would be of that much interest. 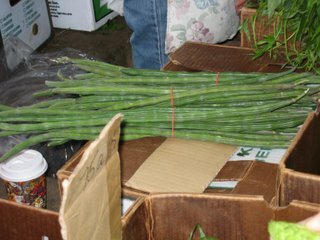 There are plenty of people selling long beans at the market this time of the year. I wonder if they are some kind of variant? They have the same long bean look, with nodes of tiny beans within the pods at regular intervals, but do look a bit more plump. Interesting. Any thoughts about making something with those fresh quinces from the market? I've never made quince jelly or membrillo, but I understand it isn't that difficult. I did, at one point, melt down some membrillo in apple juice concentrate, strain it and added some to a standard manhattan, creating the Membrillo Manhattan. The quince goes nicely with bourbon. They do look like long beans at my first glance. But when I looked closer, I was not so sure. The ones in the picture are more dark green than the long beans I have seen. Also, long beans are even in color along the length and don't have "notches" like the ones shown in the picture. 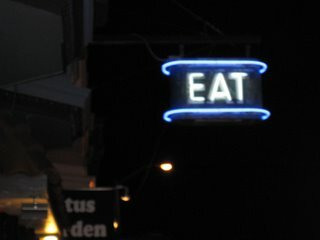 I really liked Chow on my last visit to the Bay Area. Here's the Chow thread, which I started and eje also posted on. Great looking blog, eje, and a really nice market. I was especially impressed with the mushroom selection you've got.... Did you get a taste of the truffle? What was the price and where did they come from? This market was a wonderful eye-stroll---we're NOT talking apples and oranges here. All those beautiful fruits and vegetables---it was like wandering some exotic forest filled with strange and wonderful fruit. A stew of those mushrooms on this cold day---what a late-afternoon treat that would make! And that would give just time to coddle some quinces by Chufi's recipe, turning them a deep, rosy color to match the sunset. But those long green bean things---the perfectly-spaced little knobs make them look more like long peas. This was a wonderful Autumn-day outing. I kept cricking my head sidewise, trying to figure out the picture of the satsumas. 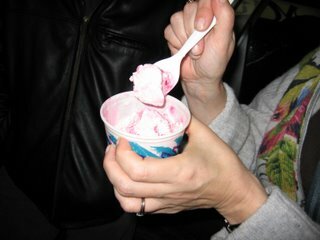 The top tier looked like a row of something with long plastic spoons for dipping; then I finally realized--- bag ears. I love the smell of Tarweed because it tells me that summer is almost over but I don't think it would make a very tasty honey. You can make a delicious quince tatin. I also make a chicken stew with quince. 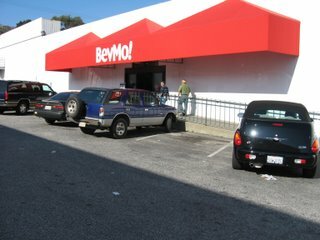 Beverages and More is a California chain of stores that sell, well, Beverages and more. 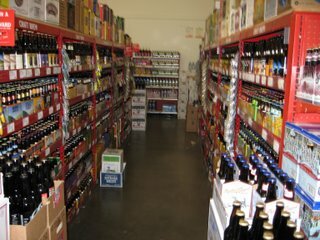 I do most of my beer, wine, and liquor shopping here at the Bayshore branch. 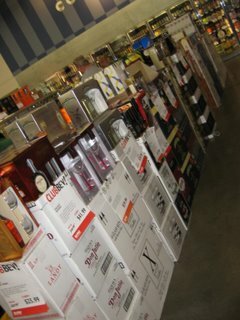 It's Holiday season so the aisles are packed with booze related gifts. 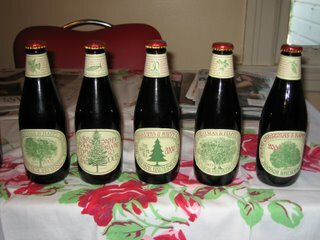 This years' Anchor Christmas Ale vertical tasting to be. Every year they use a different recipe, so it is interesting to taste them and compare. So far, 2002 usually ends up being the least favorite. Not sure if we'll get to this on Sunday. 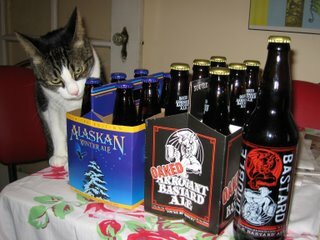 If not, will report on it in the Beer Forum. The other liquor stores I usually frequent are John Walker & Co downtown and the Plump Jack Wine Store in Noe Valley. 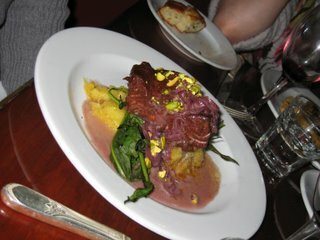 But Janet (JAZ) visited Plump Jack in her Foodblog and it's a pain to park downtown. 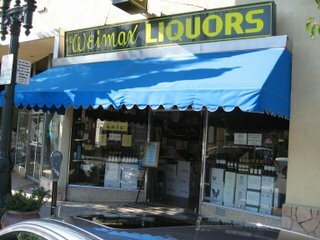 I recently discovered Weimax Liquors on Broadway in Burlingame, and was pretty impressed with their selection of dusty bottles. This dusty line of DeKuyper Geneva Gin bottles in particular intruiged me. So I returned today to pick one up. 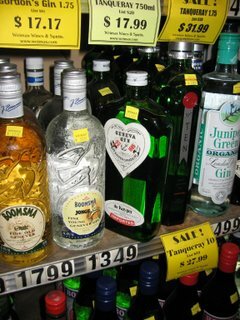 Closer inspection reveals that this gin was made in Canada and actually appears to contain cane spirits. Interesting. 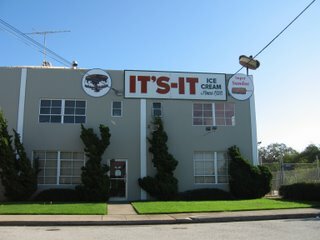 This is for the It's It fans in the audience. Unfortunately, they don't offer tours of their facilities. add to sambar, godju or similar. into a yummy chutney etc. The taste and approach - think artichoke. (seeds and all) but discard the fibrous outside. It's an art to do this politely. I've seen recipes for quince liqueurs and actually have wanted to try making one some time. Shoot, I should have gotten some. I always intend to do something with quinces; but, the local season flashes by so quickly, I usually miss my opportunity. These were particularly gnarly looking specimens. Does that mean they are extra tasty? As far as I know most of Far West Fungi's products are local. Personally, my favorites are their Chanterelles and Black Trumpets. They have all sorts of honeys. Some have such strong flavors, I can't use them for general purposes. I usually stick with the wild flower, sage, raspberry, orange blossom, or wooly blue curls. They have a Eucalyptus honey that is very strongly flavored. Another I tried was the Star Thistle. I didn't think the Star Thistle wasn't that strongly flavored when I tasted it at the market; but, by the end of the weeks of having it in my oatmeal, I felt like there was some artichoke-like bitterness that I didn't care for. The Tarweed was very strongly flavored. Is there a recipe for the chicken and quince stew available anywhere? Sounds really intruiging. A great idea for a fall dish. Wow! Cool. Thanks for setting me straight. They sound intruiging, I'll have to give them a try if I see them again. 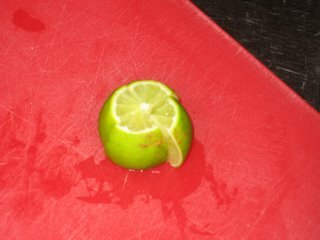 Take the ends off and quarter a key lime. Drop into cocktail shaker. Halve 2 Pineapple Guava (Feijoa) and scoop the pulp into same cocktail shaker. Add 1 tsp sugar and muddle together. 2 ounces Cachaca, a Cane spirit from Brazil. 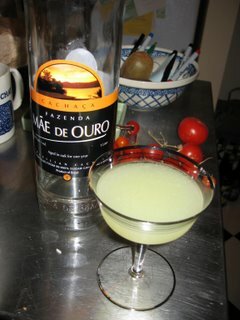 If you don't have Cachaca, use a light rum or silver (blanco) tequila. Add ice, cover and shake to chill. food blogs and tell me if it works. 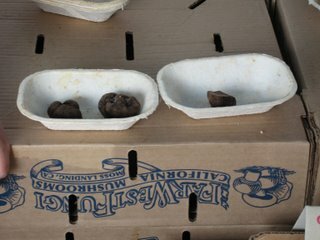 degree - if you undercook they taste raw and rubbery inside. Please tell more about Pineapple Guava? Taste and uses - l ike regular guava? or sweeter/juicier/different? I've never seen these before.. do they taste like a pineapple? guava? pineapple-guava hybrid? 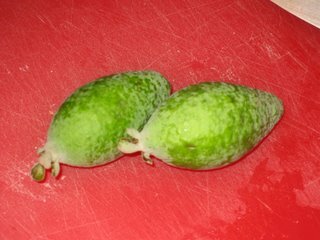 Pineapple Guava (Feijoa) are odd little fruits. They ripen in the late fall. Like all guava, they are incredibly fragrant. But, the smell is a bit like, oh, bubblegum and bananas. The flavor is somewhat pineapple-ish, and the texture a bit grainy. Seeds are small. Overall, they remind me a bit of a childhood candy somewhere between a sweet-tart and pastille. 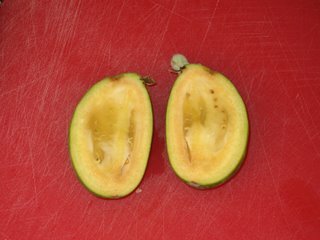 But there is also a piney/minty component, similar to a mango. On the whole, it's pretty much it's own thing. When I have guests at the Farmers' Market in the fall, it is one of my favorite things to give them a sample of Pineapple Guava, and watch their face. First they make a face like, "what the heck?" and then they usually say, "that's really weird!" or "that's kind of good." Aside from eating out of hand, I know of no use for them. This website over on the Hort.purdue.edu webserver suggests the following uses! "The flesh and pulp (with seeds) are eaten raw as dessert or in salads, or are cooked in puddings, pastry fillings, fritters, dumplings, fruit-sponge-cake, pies or tarts, or employed as flavoring for ice cream or soft drinks. Surplus fruits may be peeled, halved and preserved in sirup in glass jars, or sliced and crystallized, or made into chutney, jam, jelly, conserve, relish, sauce or sparkling wine." Tonight our friends Dr. and Mrs. 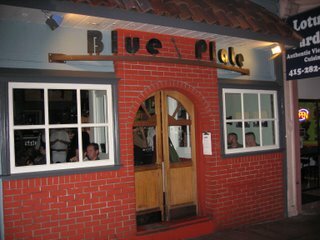 Virus have elected to meet us for dinner at The Blue Plate. 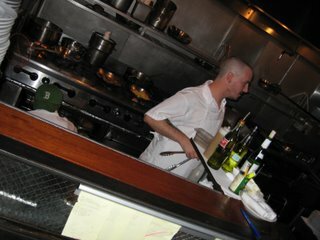 It's another restaurant we have been frequenting for years and are seldom disappointed with. There is a tiny open kitchen in front. 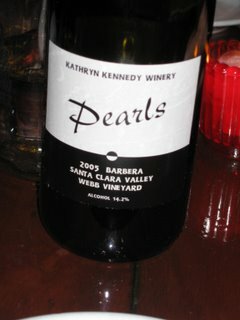 The wine was a reasonable and quite tasty California Barbera from Kathryn Kennedy. Mrs. 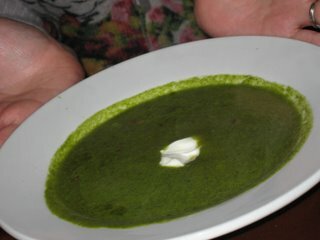 Virus opted for a bacon and escarole soup. Dr. 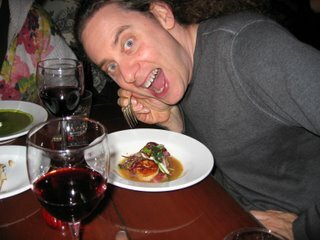 Virus (and I warned him this would be posted) was quite enthusiastic about his seared scallops. 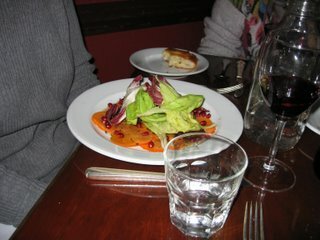 My wife chose the persimmon, butter lettuce, radicchio salad. 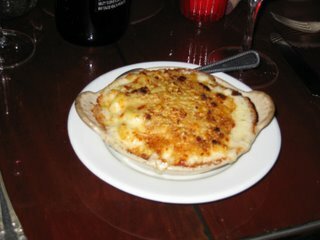 I got the Macaroni and cheese made with drunken spanish goat cheese. 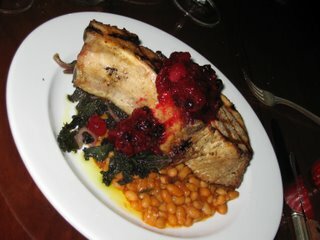 My main course was a Fred Flintstone size pork chop served with a cranberry chutney, baked beans and braised kale. I couldn't even come close to finishing this. It will make a couple good sandwiches next week. Mrs. 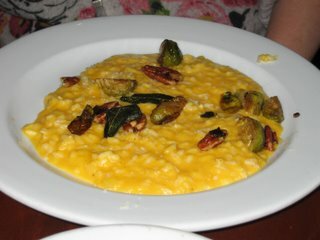 Virus opted for the butternut squash soup with brussel sprouts, pecans, and fried sage leaves. My wife opted for the wine poached local lingcod served with spaghetti squash and some bitter green we were uncertain about. Dr. 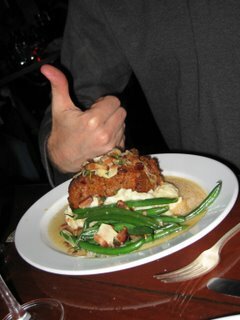 Virus strongly approved of his meat loaf served with mashed potatoes and sauteed green beans. Bacon was somehow also involved. 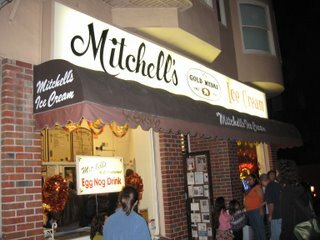 Mitchell's Ice Cream. This is about 9 PM, and as you can see there is a significant wait, even on a somewhat chilly San Francisco evening. 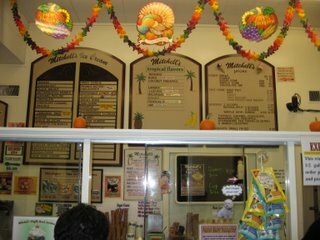 Mitchell's is well known for its tropical and South American flavors. It's not uncommon to see Kalamansi sorbet or lucuma ice cream on the list. They also do a version of the Filipino frozen dessert called Halo Halo. 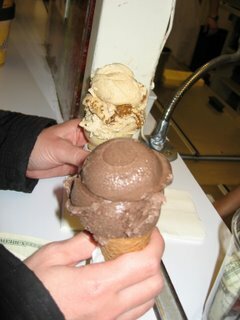 We opted for Mexican Chocolate (there ya go Jen) and Cinnamon Snap (crushed ginger snaps in cinnamon ice cream). Mrs. Virus opted for peppermint. 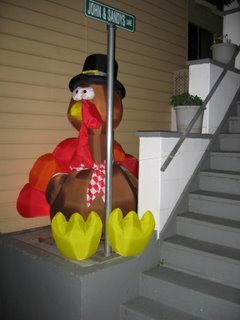 John and Sandy like to decorate. edit - oops! Jen not Jay! 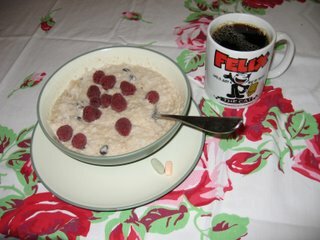 Today's porridge was Scottish style oats, walnuts, raisins, and raspberries. Whew, that was a lot of writing. Off to accumulate some real life experiences.